This stitch creates a heavily textured line useful for borders but you can also work the stitch inside shapes to create motifs like leaves etc. You have one side textured and the other less so as if light was falling on it. I admit to this variety being a bit tricky but once you get into the rhythm of the stitch it is not difficult for an intermediate stitcher to work. 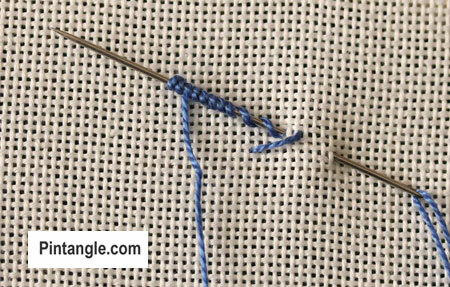 Work this stitch from top to bottom between two invisible lines. If needed you mark the outline with a quilters pen that either disappears or will disappear with steam or water. For the demonstration I have used cotton perle #5. 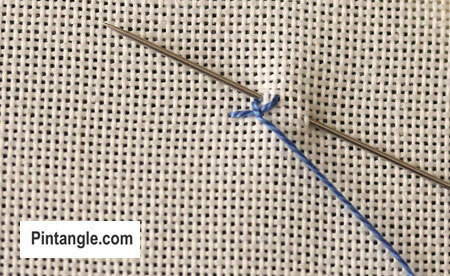 Bring the thread through from the back of the fabric on the left hand side of the line. 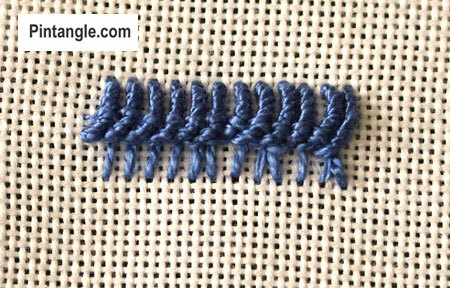 As you would with regular Vandyke stitch make a small horizontal stitch at the centre point between the two edges of the line. 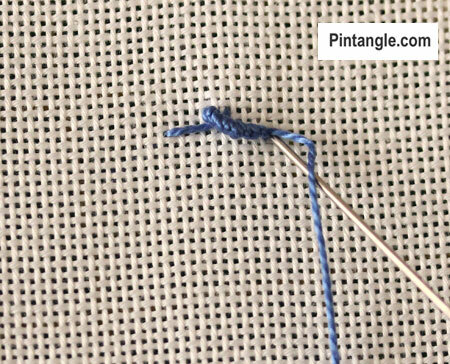 Take your needle through the fabric and insert the needle on the right hand side of the line and have the needle point emerge where the thread comes out of the fabric as illustrated. It sounds difficult but is one of those stitches that once you get the hand of it feels not so hard. After a couple of tries and getting in a real tangle, I got it! I love the stitch and will probably use it often. Whoa, that looks cool! Should try this one! Thanks for the images! 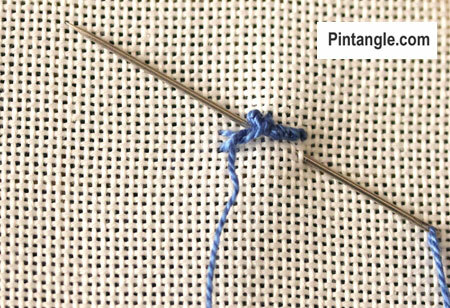 Looks like an interesting stitch to try. Thanks, Sharon!